I’m home home home after driving 12 hours in the past 32. Needless to say, after shoveling leftover, cold Indian food into my mouth late last night just after arriving home, I fell right asleep, snuggled deep into my comfortable bed. I woke up this morning and peered in my fridge- surprise! My mama had made lots of yummy jams from all the fruit we had picked on Saturday. Raspberry raspberry raspberry sour cherry and a vat of peach and lemon thyme on the stove, simmering away. Swirled into some yogurt- a lovely way to wake up and greet the day. Now, I’ve spent the last two hours taking an alcohol education program (online) that’s required for my school and taking instagram videos of my kitten. Not the loveliest way to greet the day, but whatever. I’ve been meaning to write this blog post for a while. I can’t find very inspired words. I don’t know if an in-depth post is really necessary with this cake- I mean, what can I say, I look at it and can’t help but smile… It’s just so goshdarn cute. This is the first trial of what will probably-maybe-definitely become an obsession. I think deco roll cakes are just so, well, kawaii. They’re Japanese-born, mainly thanks to Junko, who has written a few books about them and whose roll cakes are incredible. Unfortunately, I don’t speak Japanese, so I used someone else’s adaptation of the Google translated recipe on Junko’s blog and I used a joconde imprime decor paste (used for joconde, or almond flour, sponge cakes). It didn’t come out quite how I wanted, as the imprime decor paste didn’t meld well with the actual sponge batter. I’m going to hunt for some more deco sponge cake recipes/techniques to try, so that the decorations will be more united with the cake. I made other adaptations that I liked- I added a vanilla bean Italian meringue on the interior instead of the traditional whipped cream, because I just love that marshmallow-y fluff, and it added sweetness without being overpowering. Some notes: if you aren’t familiar with sponge cakes, don’t do the decorations. Instead, focus on learning how to make the (two) batters and roll the cake without cracking it. The trick is to use a couple liberally sugared towels to roll the cake up before filling it. Also, wait till it’s cool! Cream the butter and sugar together for at least 3 minutes, until fluffy, shiny, and pale. Add in the egg whites; mixture will appear to curdle. Mix as well as you can to get the mixture as homogeneous as possible; it won’t be completely mixed. Stir the cornstarch and flour together and add into the mixture. Beat on high until just combined. Divide the mixture into 4 100-gram measures and tint as desired. Pipe your designs onto a greased, parchment paper lined 15×10 sheet pan (jelly roll pan) as desired; I piped small polka dots. Freeze for at least 15 minutes, or until designs are completely hard. Combine the egg yolks and sugar in a bowl (not your stand mixer bowl, if you have one! Use a whisk or electric mixer for the yolks and a stand mixer for the meringue). Beat the yolks on high or whisk briskly for 3 minutes, until doubled or tripled in size and very pale. Add in the milk, oil, and vanilla and beat just to combine. Check on your egg whites; once they reach stiff peaks, turn the mixer off. Sift the cornstarch and flour over the egg yolk mixture and fold to mix. Now, bring the two batters together. Take 1/3 of your meringue and gently mix it into the egg yolk batter with a spatula. Once combined, fold the rest of the meringue into the batter gently. Once it is all mixed, remove your sheet pan from the freezer and gently spread the batter over the piped design. While the sponge is baking, prepare yourself to flip it and roll it. Lay out one of the towels on top of the sheet pan or cutting board and sift powdered sugar all over it, very liberally. Lay out your other towel on a countertop and sift powdered sugar over it, very liberally. Once your cake comes out of the oven, you will flip it onto the sheet pan or cutting board that has been lined with the towel. You will then peel the parchment paper off of the cake; you will see the baked-in designs- this will be the outside of the roll. You will then take the sheet pan/cutting board and flip the cake over onto the other prepared towel that has been covered in powdered sugar. You will then carefully roll the cake up in the towel, secure it by twisting the ends slightly, and place it on the wire cooling rack to cool completely. It is best to run over the steps in your mind before doing them so that you do not panic when the sheet cake is warm, because time is of the essence when rolling. Rolling a warm cake will prevent cracks, but stay cool and composed. Once the cake is cooled, you will unroll and release it from the towel and fill it with meringue. Place the egg whites and cream of tartar in the clean bowl of your stand mixer and turn it on to a speed around 3-5 on a KitchenAid. Meanwhile, place the sugar and water in a heavy bottomed pan fitted with a thermometer. Heat the sugar syrup until it reaches 245 degrees F, at which point the whites should have reached stiff peaks. Slowly pour the syrup into the whites with the mixer running; allow to whip until the meringue reaches body temperature. Sometime while the mixer is still running, add in the vanilla seeds. 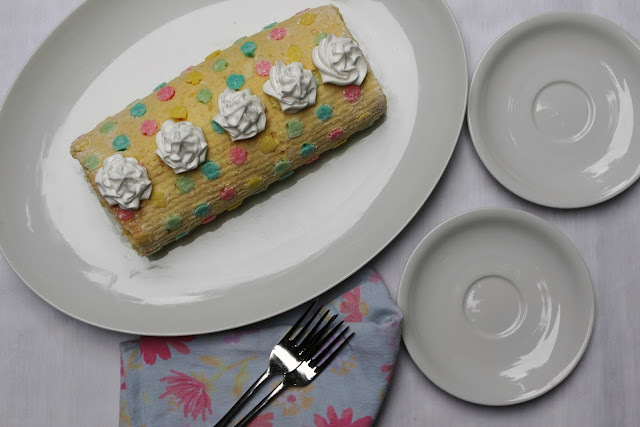 Once the meringue is cooled, spread a thick layer over the interior of the cake roll. Roll up the cake and pipe some decorative meringue on top.